Most beers are good to drink in summer… but some beers were born for it. 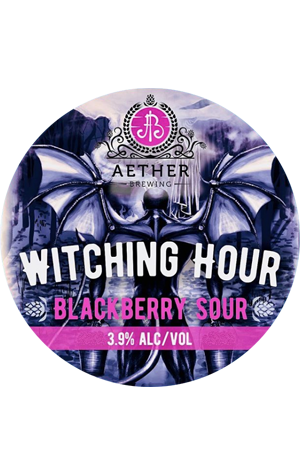 Witching Hour Blackberry Sour (an occult-ish name softened by a delightful rhyme) is Aether Brewing’s summer seasonal release, and it’s a beer that grabs you right from the moment you see the impressive gothic artwork on the decal or can. The pour isn’t the dark purple of the fresh Queensland blackberry puree that was added to the brew. Instead, the combination of the blackberries and the classic light gold of the Berliner weisse make for a slightly opaque deep pink – think ruby grapefruit, or guava juice. The fluffy white head gives a waft of berry tang to the nose, before dissipating and inviting you to venture further. Though the name hints at a terror not suitable for children, the taste brings on a flurry of nostalgic memories of childhood. The fizziness: Fruit Tingles tingling away on your tongue. The sharp tartness: berries picked and gobbled after school, causing you to pull a face before going back for more. The sourness: berry Warheads going to work on your middle palate and making your mouth water. The acidity: Wizz Fizz sherbet, shared with friends and yet still in abundance. Finally, the lingering aftertaste is a slow transition from the tartness of the berries to a subtle breadiness from the wheat, reminding you that this is in fact a Berliner weisse, not a portal to your 12-year-old self. The malts keep the beer well-balanced, so the blackberry is never overpowering, and yet they’re the main thing you remember after the fact. Refreshing and palate-cleansing. Best consumed at a barbecue on a stinking hot summer’s day. Or, you know, with ominous storm clouds threatening and bats flying overhead.